I recently took a leap of faith and left a job I’ve had for the past eleven years for a new one. A totally different, hopefully more rewarding, job working with people with disabilities. A far cry from retail, I know. 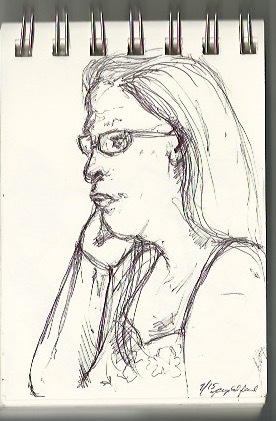 To the point of this post… I had the opportunity to sketch a little during the week long orientation. 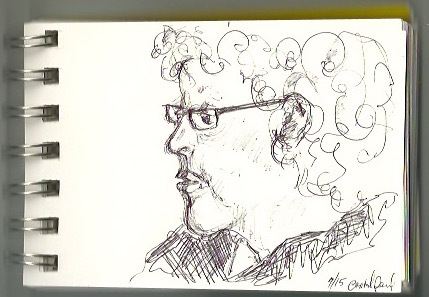 I know I started a quest for 365 portraits awhile back, which i admit failed miserably, but there wasn’t much to sketch in the room we were in except people, so I went for it. These couple of sketches were done with ballpoint ink in a tiny little sketchbook I only recently rediscovered in my workshop, and have thus started carrying it around in my handbag. I guess it finally came in handy. Enjoy.